On November, 8th, 1941, the Hitlerites captured Yalta and the whole of the Crimea's Southern Coast. Throughout the temporary Nazi occupation in the inhabited areas underground fighters were acting while in the mountain forests partisans were carrying on daring operations. The invaders have caused the town a great damamge amounting to 400 million rubles. They killed and tortured to death about 4 000, took away to the concentration camps in Germany 5 700 people. 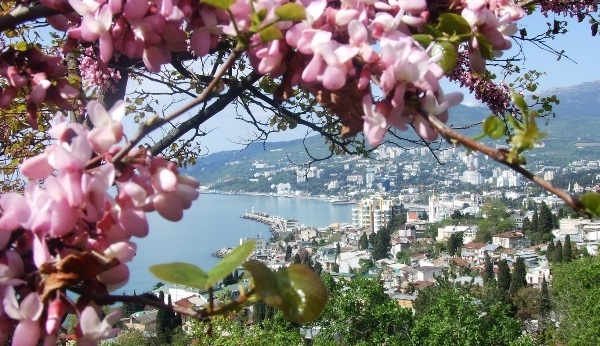 On April 16, 1944, the units of the Detached Seaboard Army (commanded by General Andrei Eremenko) liberated Yalta, Alupka and the resort settlements from the hostile troops. The feats of arms accomplished by the Soviet people on the South Coast have been immortalized by monuments and memorial obelisks, many of them have been erected on the common graves of the Red Army men. The majestic monument to the fallen - the Memorial Complex with the Eternal Flame has been built on Darsan Hill (the Mound of Glory). This is tribute to the memory of not only the heroes of the Great Patriotic War but of the fighters for Soviet Power in the years of the Revolution and the Civilian War (1917-1920). The memorial has the shape of a broken ring resting upon the supporting props. In the centre is a cavity with the Eternal Flame. The internal spherical surface bears reliefs, reflecting the revolutionary struggle of the working people the making of the Republic of the Soviets born in battles, the heroic spirit of the great war of liberation against nazism. Engraved on the black granite slabs in front of the cavity with the Eternal Flame are the words: "You are with us, there are no dead for glory”. The whole composition is dominated by the image of a grieving woman accompanied by the representations of the sun and a laurel branch – the symbols of life, peace and eternity. The Memorial Complex on Darsan Hill is a kind of pantheon of glory. It is a requiem and hymn to those who have fallen in the fighting for the Revolution, for the freedom and independence of the Mothercountry. The monument was designed by the architect V. Peterburzhtsev and A.Popov. The reliefs have been made from the drafts done by Y. Orekhov. The solemn unveiling of the memorial took place on November 5, 1967, on the eve of the 50th anniversary of Soviet Power. On the southern side of the mound a stele dedicated to the memory of those who fought for the establishment of Soviet Power in the Crimea has been erected. The monument is faced with slabs of red granite on which are engraved the names of Mikhail Frunze, Dmitri Ulyanov, Vasili Blucher, Jan Tarwacki and other heroes of the October Revolution and the Civilian War whose lives and careers were connected with the Crimea and its southern coast. The author of the design is the architect P.Starikov.